This article is an educational one – if you’ll be patient enough to get through it, you will learn how to give yourself a lymphatic drainage massage. This may sound scary, but this practice is something everyone can do for themselves right at home. There are, however, some disclaimers: if you have a medical condition or any doubts about your health, please talk to your doctor and ask for a professional medical advice beforehand. Lymphatic drainage probably isn’t the first thing that comes to mind when you think of self-massage. So, let’s learn more about this technique and its positive effect on your health. Humans have hundreds of lymph nodes located throughout their bodies. 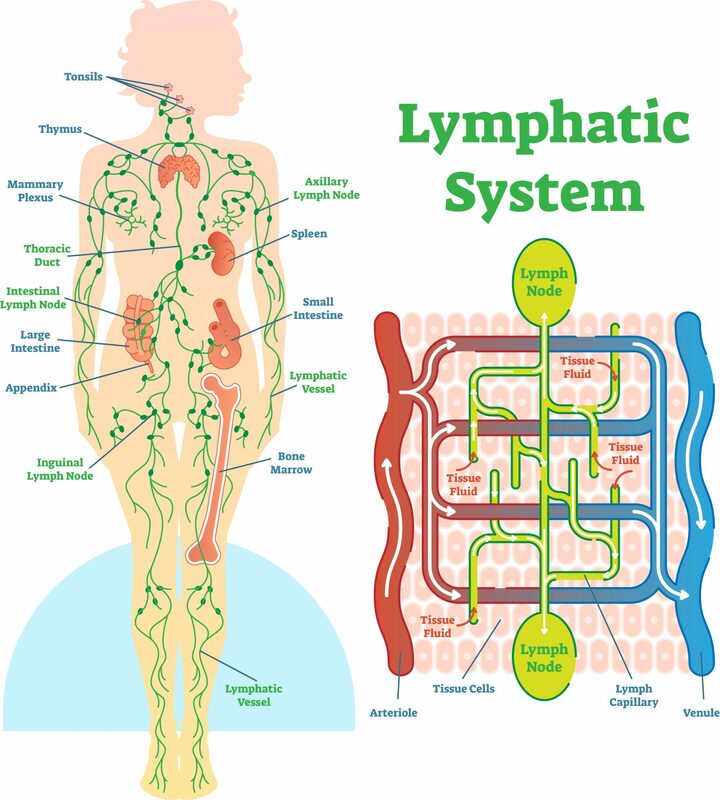 They are connected to one another by lymph vessels, and altogether they form a lymphatic system of your organism. The job of the lymph nodes is to filter different substances that come with the lymphatic fluid and to fight diseases and infections with the help of lymphocytes (white blood cells). Simply speaking, this system helps your body remove toxins and waste. Why is it a good idea to learn a lymphatic self-massage technique? In our days, there are much more potentially harmful chemicals flooding our environment than a century ago. Cosmetics, food, beverages, even the air we breathe – all of it contains hundreds of previously unknown dangerous elements – way more than a human body is naturally ready to deal with. Even though our bodies have a natural resistance to toxins and many detoxification systems, it was never meant to deal with that much of a trouble. Consequently, our protection systems fail to process all of those elements accordingly, and our bodies get overloaded with toxins that build-up in your system and get stuck. That’s where the health issues come in. Allergies, digestion problems, skin issues, weakened immune system – all of this can indicate the fact that your body is overloaded with toxins. Even simpler things like being tired all the time or never feeling rested after a long sleep can mean the same. Over time, these excess toxins can affect your health even stronger, leading to worse conditions and illnesses. So, to help your lymphatic system run smoothly, you can learn the proper massage technique. Most of your lymph nodes are located on the front of your body, so it’s easy to access them for a simple procedure. First of all, let’s learn what areas of your body should be involved. A middle area of your stomach near your solar plexus. By massaging these nodes, you are helping your system speed up and release stored toxins into the flow of your lymphatic liquid, so they can later be dissolved and flushed away out of your body. This is a painless practice that doesn’t require any special equipment. You can perform it almost anywhere – it only takes a few simple movements and about 5 spare minutes of your time. Begin by lying or sitting on a comfortable flat surface. Using your fingers, locate the areas mentioned above (you can also refer to the picture of the lymphatic system). Press firmly into the skin where the points are located. Pick one or two points at a time. With firm pressure, start massaging the points in a circular motion for about 8-10 seconds per one area. If a certain area feels tender, work on it for a few more seconds, but be gentle. After you’ve finished with one point, move on to another, until all the areas have been covered. At first glance, it does seem like a lot of areas to cover, but in reality it only takes around 2-4 minutes to perform the massage! Its speed and simplicity allows you to do it almost anywhere: on the road, before sleep, at lunch, or even when you’re stuck in a traffic jam. Although this method is quick and relatively easy to perform, don’t rush to finish it as quick as you can. Take some time to thoroughly cover as many points on your body as you can – use a scheme for a reference. If you have an injury or a bruise on the point, skip it until it is healed. If during the massage you find that a lot of the lymph points you touch are tender, it could mean that your body does have a stock of loaded toxins. Do not massage all of those areas at one time. Simultaneous influence on most of your tender points can lead to feeling flu-like, when those harmful elements are released in huge amounts altogether. In that case, go slow and gently massage a few of such points at a time. If you have any doubts or concerns about your health, ask your doctor for a medical advice. Your body transformation starts with sticking to a healthier and more active life filled with regular exercise.